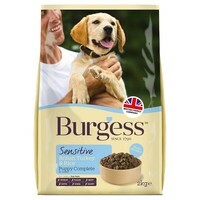 Burgess Sensitive Puppy Food (Turkey & Rice) is a premium hypoallergenic, complete diet that is suitable for puppies with delicate digestive systems. Containing only essential, functional ingredients to keep the recipe free from all the usual ingredients that can upset their stomach, Burgess Sensitive helps to nurture and support healthy growth in young puppies. Pea Protein: A good source of protein that provides balance for delicate tummies. Lucerne: A rich source of naturally occurring antioxidants.